A recent Facebook post brought smiles to Cajun Navy Foundation volunteers when a woman reached out to simply say thank you. 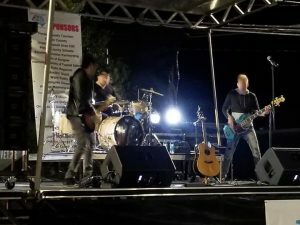 Andi Ulm had attended a benefit concert in Pender County, North Carolina, held to raise funds for residents affected by Hurricane Florence. She wanted CNF to know that the citizen-led volunteer group had come up in several conversations at the event. During the conversation, there was also mention of a situation in Pender County where Cajun Navy had supposedly been turned away by local emergency officials. Godwin was able to shed some light on the circumstances. “There was a minor ordeal with another group who uses ‘Cajun Navy’ in their name, plus there was some confusion about them being told to leave. There is always that confusion immediately following a disaster. There is always protocol to follow in times of a disaster and they are set by the local EOC. Immediately following a disaster, civilians, which we are, are not allowed into a disaster area until it has been secured by the local officials. Once they are confident that it is safe for us (our volunteers) to enter, we are given the green light to bring in volunteers, boaters and / or boots on the ground, as long as we go through them in the very beginning. We have always coordinated with the local EOC. It is the only safe way to protect our volunteers, as well as work efficiently with the local EOC on behalf of those in need. Godwin thanked Ulm for relaying the message from the people of North Carolina. “There is always a bit of confusion in the beginning, but it all works out with a little bit of patience and determination. Neighbors helping neighbors. That is what Cajun Navy Foundation is all about,” said Godwin. 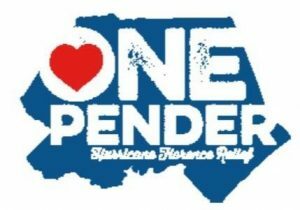 Bands performed at the One Pender event in Burgaw, NC to raise funds for victims of Hurricane Florence. Cajun Navy Foundation encourages anyone who was affected by Hurricane Florence, Hurricane Michael or by the wildfires in California to visit its citizen-led platform, www.crowdrelief.net/V1/ChooseEvent.aspx. Those in need of assistance can register their homes and reach out for help through all stages of the recovery process. Others who would like to donate or send supplies to those in need are appreciated, as well. Help us help our neighbors rebuild their homes and lives. Send stories and news to Lori@Cajun.Navy.